RYANAIR MANAGEMENT HAVE written to Dublin pilots warning them not to engage in any strike action or they will face a loss of benefits and cuts to pay. 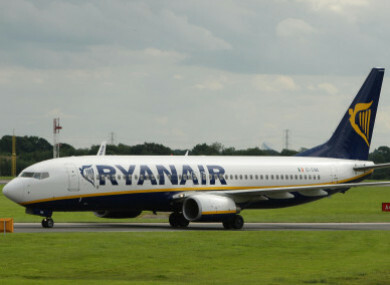 The warning comes following a letter from the Irish pilots’ union Ialpa to Ryanair which states that the union will ballot its Ryanair members for industrial action if airline management does not engage with it over pilot pay and conditions. Ryanair has repeatedly stated that it does not engage with third-party unions and all contract and pay negotiations are dealt with internally through its Employee Representative Councils (ERCs). Ryanair pilots can be members of unions, but the airline does not recognise them when it comes to negotiating pay and conditions. ERCs are employee representatives at each of the airline’s 86 bases across Europe and Northern Africa who enter negotiations with management. Following on from Ryanair cancelling 2,100 flights between September and October and a further 18,000 between November and March, there have been widespread reports of discontent among pilots at the airline. Pilots have demanded improved pay and conditions from the airline and the right to have union representation for collective bargaining across all of Europe. Pilots at a number of bases – including Dublin, London Stansted and Madrid – have rejected proposals from management around pay and conditions. To achieve their aims, pilots across Europe unhappy with the ERC system set up the European Employee Representative Council (EERC) to advocate and bargain on behalf of all Ryanair workers. Ryanair has also said repeatedly that it does not recognise the EERC and will not negotiate with pilots in this fashion. Following on from months of back and forth, a pilot union in Italy has said its Ryanair members will be striking on 15 December, while in Portugal Ryanair members of a union have also voted to strike. In the Ialpa letter to Ryanair, union president Captain Evan Cullen calls on management to engage with Ialpa over pilots’ pay and conditions. Cullen states that if Ryanair fails to do this, “we reserve the right to ballot our members for industrial action up to and including strike action without any further notice to you”. In response, Ryanair’s Chief People Officer Eddie Wilson wrote a letter addressed to the ERCs in Dublin and to all Dublin pilots, warning that the airline will meet any industrial action by pilots “head on”. He said that Ryanair received a letter on behalf of the “Aer Lingus Pilot Union [referring to Ialpa], threatening industrial action by Ryanair Pilots in Ireland at Dublin, unless Ryanair recognises the Aer Lingus Pilots Union”. “This simply will not happen,” Wilson wrote. “If any such action occurs, then we must assume that Dublin Pilots – for the moment – no longer wish to deal directly with Ryanair and we will withdraw those benefits which are dependent on out direct dealing collective agreement,” he said. This means the Dublin base will – until further notice – be frozen with no promotions for FOs (first officers) or SOs (second officers) or no transfers facilitated out of base. Wilson goes on to say that monetary base allowances and annual allowances will all cease if any industrial action is undertaken. He also said that the airline may be forced to rebasing some Dublin aircraft to “lower cost airports based elsewhere in Europe where our Pilots continue to deal directly with us”. Wilson said that pilots in its Cork, Shannon and Belfast bases had voted in secret ballots and had recently approved amendments to each of their collective agreements. He listed a number of benefits and wage increases that pilots there will now have, and said that Dublin pilots could also avail of these. In a letter sent to Wilson on 23 November, a number of the ERCs from Dublin, Cork and Shannon expressed concern that pilots in Cork and Shannon had been invited to “take part in a voting process that has not been arranged by the pilots elected representatives”. The ERCs were concerned that this process would “circumvent your own representation system” and said they had been led to believe the vote would be around pilots’ pay and conditions in the bases. “We are not aware of any negotiations that have taken place in this instance and we are not clear on what basis pilots in Shannon or Cork are being asked to vote on something that has not been negotiated through or with their representatives,” the ERCs said. They requested that the voting process organised for Cork and Shannon “be cancelled immediately”. In his letter to Dublin pilots, Wilson states they could avail of pay increases if they follow the ERC process. He said that the increases would put Ryanair Dublin pilots 22% ahead of other low cost airlines in terms of pay. “Everyone who joins Ryanair clearly understands that we do not negotiate with Pilot Unions,” said Wilson, referencing instead the ERC system. He closed by saying management was available to meet with the Dublin ERC. We don’t comment on communications with our people. Email “Ryanair threatens Dublin pilots with pay and benefit cuts if they strike”. Feedback on “Ryanair threatens Dublin pilots with pay and benefit cuts if they strike”.